Start this in winter by digging a trench roughly 12-14 inches deep and 12 inches wide. Line the trench with newspaper and fill with kitchen waste and cardboard, and cover with soil. Come spring this will have composted down providing rich damp soil. 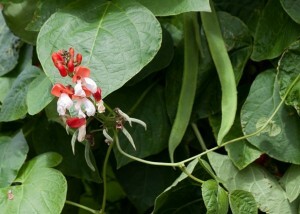 Runner beans are not a hardy vegetable, so hold off sowing indoors until April/May and mid-May if you are sowing direct. If sowing directly outdoors, sow at a depth of 2 inches at the base of your canes. 2 or 3 plants per cane will be plenty. Runner beans are traditionally grown in rows up bamboo canes. Place your canes roughly 10-12 inches apart, in rows 12-16 inches apart. Angle the canes so they meet at the top and provide as much support as possible. Once the beans get going, they can be quite heavy. The plants will wrap around the canes themselves and once they reach the top, pinch out the growing tips to encourage bushier growth. Once the pods start to form, you can pick them off for a tender crop. Otherwise leave them to grow longer and pick them off when required. You can also allow the pods to swell and harvest the beans from them, and if you want seeds for next year allow the pods to dry.